Compass’s new pamphlet describes itself as ‘simply an opening argument; an outline of the broad approach to the type of transformative change we need to see happen’. In sets out Compass’s ‘next steps’ through its work through the ‘Common Platform’, engaging with various groups in order to continue learning and building alliances. Working with civil society organisations and state actors, Compass wants to work out ‘what is happening, why and how’, as well as understanding some of the barriers to scale both groups face. It also wants to ‘build bridges across the 45° fault line’ by ‘developing relationships and understanding between people and organisations on either side of the line’. 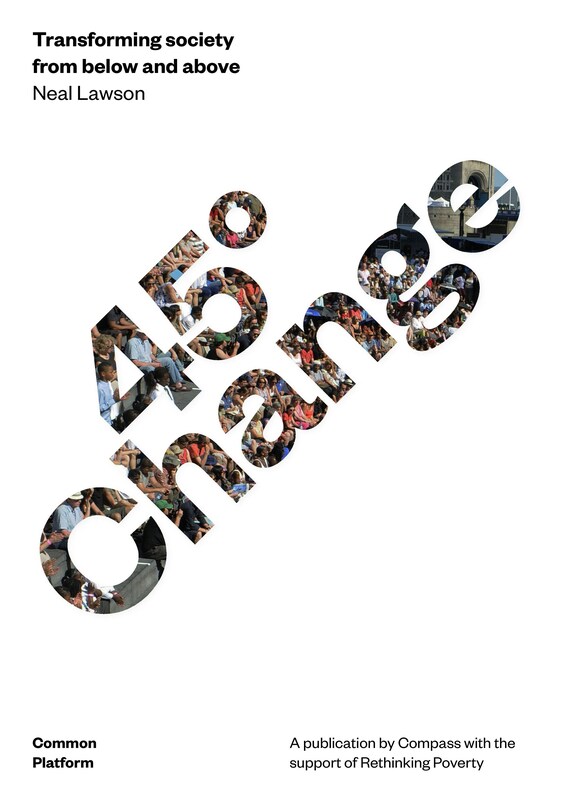 The report then highlights some of the initiatives that already exemplify the spirit of 45 Degree Change, across civil society, the state and new media, in the economy and in politics. This includes Citizens UK – a chapter of which, Tyne & Wear Citizens, we feature in #theplacewewant – which ‘mobilises communities across a range of issues such as the living wage and immigrants’ rights’. Also mentioned is the ‘Preston model’ of local wealth-building as pioneered by CLES.